Bad reviews can destroy a business, however at English fish and chips shop The Bunker management’s witty responses to bad reviews are gaining public attention worldwide. After several negative reviews from upset customers, the shop’s manager spent some time responding in the “nicest” way possible. The responses on travel forum TripAdvisor are drenched in sarcasm, with one of the best being a cutting takedown of a customer who complained their fish was too greasy. Management’s hilarious answer came quickly, saying: “Your comments are duly noted sir and from now on we shall be frying our fish and chips in daffodil extract. When a group of customers threatened to never return due to the expensive chips, management were quick to put in their two cents. “We take note that you and your 9 friends won’t be visiting here in the future, and will take this into account when preparing next year’s budget forecasts,” they responded sarcastically. The shop also poked fun at one of the more descriptive reviewers who questioned whether they would bother returning to the store. “I hope you give this possible future visit a great deal of thought, before making such a crucial decision. Godspeed,” management wrote in reply. 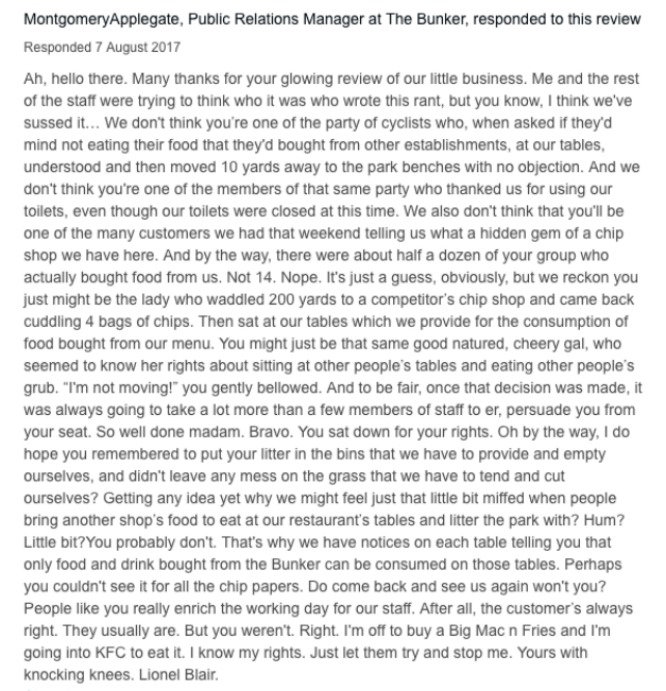 However, the pinnacle of responses might just be the almost 500-word answer to a displeased customer who was asked to move after she and her group consumed food from another business at The Bunker’s tables. The shop singled out the reviewer as the “lady who waddled 200 yards to a competitor’s chip shop and came back cuddling 4 bags of chips” and shamed her for rudely refusing to move when asked to eat her food elsewhere. The full response to the upset customer. Source: TripAdvisor/The Bunker, Seahouses. The Bunker is rated 4 stars out of 5 stars on TripAdvisor and also avidly responds to positive reviews to show their appreciation when customers show their support. And while they might not be able to satisfy all patrons, The Bunker certainly succeeds when it comes to putting naysayers in their place. You’ve been warned!